Adidas are brewing something very special and tease with their new big, innovative launch. It is coming tomorrow. It is going to be massive. And you know exactly where to look, when you want find out more tomorrow. Adidas may have been in the football boot game for a very long time, but they are far from old fashioned, - quite the contrary in fact. The German brand has lined up the innovation canon and are ready with a brand new, groundbreaking football boot. It is not much Adidas have let slip about their new boot, which lands tomorrow, but they have across all their social media platforms dropped small hints about, what we can expect on the 27.02.14. And hey, is that not three Samba coloured pieces of yarn rolling across the screen…? 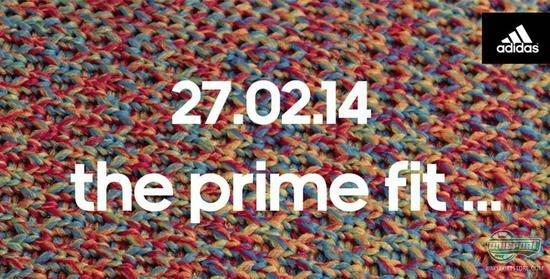 The teaser picture gives a good picture, as it shows a multi-coloured, knitted background, with the text “The prime fit”. And OK, grandma’s knitted shirts are very comfortable, - but can you really use knit and weave on a boot? More info coming soon. Adidas’ newest innovation lands tomorrow, where you can naturally read much, much more. We are in any case really looking forward to hearing what you think. Until then you can freely guess at what you think is coming. Share your thoughts in the comment-section down below, or on Facebook and Twitter.